Today I was watching the 2014 University of Texas Commencement Speech by Admiral McRaven with my students. It doesn't matter how many times I watch it (or how much of a military girl I am not), I love his speech. One of my goals this year is to build a strong sense of community within my classes. I have been preaching that we leave "no man or woman behind." The inspiration for this is my class from four years ago, this year's seniors, a group that built a community of learners and, for me, created on of my most powerful teaching experiences. I have had the best start this year than I have for awhile. Every day, I drag my exhausted, but exhilarated self to my desk. I stand through most classes, walking my small strip of carpet while I talk. I see many old faces and many new. Seeing my old kids is inspiring...seeing how they have grown into young adults is amazing! I have on of my old students who is coming into my room during lunch, then goes to his math class after. He is doing the required work just because. The passion that I feel I helped instill years ago is fueling my own passion. I am ready to change the world. 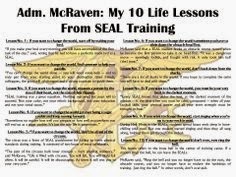 According to Admiral McRaven, I only need to change 10 people, then they change ten and so on. It's a little like the shampoo commercials of the past but it is an exponential growth model of change...simple, yet powerful. This is the year...I really feel it...I am excited! If you haven't watched Admiral McRaven's speech, I recommend it...what starts here changes the world...let's change it...together!